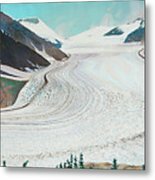 Salmon Glacier, Frozen Motion is a painting by Stanza Widen which was uploaded on July 25th, 2016. Although in winter the Salmon Glacier is probably inaccessible to any visitor here, it is different when midsummer returns. 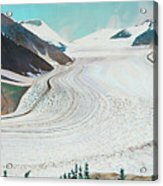 Ted's new panoramic painting with fireweeds flowering in the foreground shows the incredible size of the fifth largest glacier in the world. As with most of his paintings, he included a small addition of our local wildlife, this time there is a pair of marmots sitting on a rock near the bottom righthand corner. To get there, visitors in Stewart, British Columbia in Canada will need to cross the Canadian border, then drive through our fascinating neighbour, the Alaskan town of Hyder which is 2 miles away which is worth an exploration of its own. Leaving Hyder, one can stop and look for bears while protected by the boardwalk at Fish Creek before heading towards the glacier which is now easily accessible. There is a lookout point where you can park your car and look straight down on this magnificent sight with a Canadian flag flying up above. This is because you are back in British Columbia, but need to return to British Columbia through Hyder in Alaska once again! This is very confusing but has something to do with how imaginary lines were drawn on maps by people who never set foot on this land!?! ALL IMAGES by Ted Widen (signed TW) DO NOT BELONG TO THE PUBLIC DOMAIN. ALL IMAGES ARE THE COPYRIGHT OF THE ARTIST, TED WIDEN. ALL RIGHTS RESERVED. COPYING, ALTERING, DISPLAYING DISTRIBUTING AND/OR SELLING ANY IMAGE WITHOUT PRIOR WRITTEN CONSENT FROM THE ARTIST IS STRICTLY PROHIBITED. Love your work on this one! Nice composition as well as the actual brush strokes to create this true work of art! BEAUTIFUL CREATIVE WORK!! I love this painting! Love RjFxx Adding my LIKE now! Treasuring this painting, Stanza. So unique and informative too. 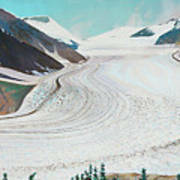 Love Ted's sweeping painting! A beautiful Wow! v/f!!! Astonishing, Stanza! The slope meanders down the center, giving the glacier life...plus the marmots!